The iPad Revolution has arrived. Actually it arrived over half a decade ago. Wow! In this iPad tutorial series I aim to share with you what I know and have learned about these wonderful devices. Starting with the iPad Revolution, we look at how the current devices came to be and the impact on our lives. The iPad Manual tutorial focuses on how to use your tablet better. It is crammed with hints and tips! Find My iPad shows you the techniques and software available to locate your device in the event of misplacement or theft. This has helped numerous people all over the world, and it is easy to do! iPad Updates shows you how to keep your device's Operating System up to date. This tutorial is based on iOS v7. Following the release of iOS v8 in September 2014, this tutorial guides you through the steps for this iOS version. Note the similarity between the two update processes. Future iOS update releases are unlikely to vary in how they are applied. Latest iPad News streams the latest news and information from around the world on the iPad. The iPad revolution began in January 2010 when Steve Jobs (Apple CEO) announced a 'new' type of mobile tablet device to the market: The Apple iPad. The saturated computer market is dominated by Personal Computers (PC's) and Apple Mac's of various types and models. The mobile phone market evolved towards Smartphones where an increasing number of features from PC's are available, such as Internet access and 'Apps' for Facebook and other on-line services. The Tablet computer market sits between computers and smartphones. PC's are not mobile. Laptops are mobile but can be seen as cumbersome to transport. Smartphones are convenient but can be seen as too small for undertaking prolonged computing tasks. Tablet computers are nothing new. 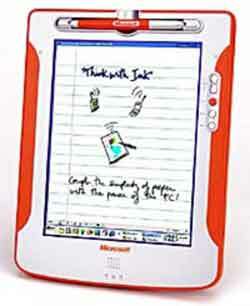 Since 1968 various iterations of tablet devices have come to market without success. 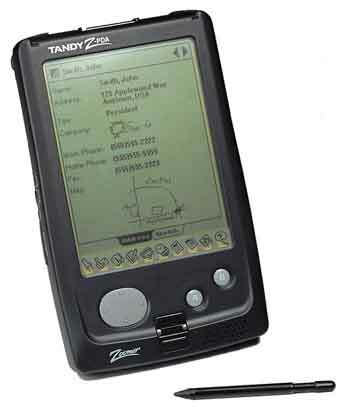 From the Personal Digital Assistant (PDA) era such as the Tandy Zoomer in 1992, to the Microsoft Tablet PC in the year 2000, these models and others like them failed to capture the public imagination. I remember the Palm M500 Series PDA's from around 2001 that you had to dock in a cradle connected to your computer via USB to synchronise your e-mail. I was always sorting our synchronisation issues with these things in my days as a support technician! HotSync (The Sync software installed on your computer) rarely worked consistently. In the UK Healthcare environment at the time Pharmaceutical Companies offered 'Free PDA's' as incentives for drug contracts. They were expensive kit at the time, and we (IT) did not have any control over which makes and models we ended up supporting. Very frustrating! It seems to me for over 40 years the idea of a mobile tablet computer is one that both home computer users and business people like. However, there is confusion about what to use them for, and how to make them easy to use. This brings us back to January 2010, and the start of the iPad revolution. The gap in the market between the Mac and the Apple iPhone is about to be filled with the iPad. 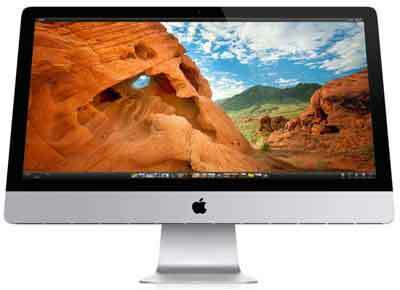 The Mac comes in various models such as the MacBook Pro, MacBook Air and the iMac, running the OS X Operating System. Hardware e.g. weight, durability, touch screen interface etc. Personally I was sceptical at the time of the announcement, considering the Tablet history outlined above. My immediate thought was "Apple will have to produce something special to capture the consumer market, but what about the Business market?". We now know this was the beginnings of the iPad revolution, and indeed the kick-start of the long-awaited tablet computer market. Next we look at what the iPad offers you as a typical home computer user. The iPad revolution starts with the launch of the iPad version 1.1 (code named K48). This is the Official Apple Press Release (Opens New Window). Listen to the full keynote demonstration direct from Steve Jobs himself. It is about 90 minutes duration, but very fascinating. The iPad has a 9.7-inch screen, 10 hours of battery life (very impressive at the time! ), WiFi, 256MB RAM and a 1GHz A4 processor as standard. Different storage capacities (16, 32 and 64GB) and capabilities such as 3G HSPA access are available at additional cost. Surprisingly it has no camera, and is available in black only. The App Store made all 200,000 applications available to the first generation iPad. 5000 of these apps are native to the iPad at the time, with the rest written specifically for the iPhone. Today the Apple Store boasts over 1.4 million apps, with around 500,000 written specifically for the iPad. Many of these apps are regularly updated; introducing new features, fixing bugs, etc. Almost everything you need, from banking apps to games, is now available to people from all walks of life on a light, easy to use, convenient piece of hardware. Apple's strategy for the iPad was not entirely clear in 2010. Commercially successful with over 1 million iPads sold in the first 28 days, initials reviews were generally positive. However the staged releases of the iPad across the world and subsequent technical improvements shows Apple reacting to the ever changing demands in the tablet market. A multi-touch user interface which is finger driven is very different to what most people are used to. Even in 2010 experts in the industry were predicting big things for the iPad, even to the extent of the demise of the mouse and keyboard! The iPad revolution is well and truly born. Next we look at how the iPad evolved over the next 3 years. 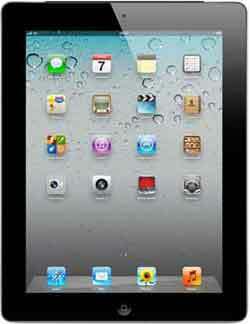 By early 2011 the first generation of the iPad was discontinued after hitting over 15 million in sales. The iPad 2, released in March 2011, boasted front and rear cameras, faster processor, more memory (512MB RAM) and a thinner, lighter chassis. The big changes for the iPad 2 includes the introduction of FaceTime, and inbuilt application to communicate/video conference with friends, family etc., and Apples launch of the iCloud, a storage service for your video's, pictures, music, documents etc. iCloud also acts a a syncing centre for your e-mails, calendars and notes in addition to your pictures and documents (Remember the difficulties doing this with PDA's!). As the tablet market is constantly evolving, and competitors release their own tablet computers, the 3rd generation iPad was soon released in 2012, after 11 million sales of the iPad 2. The big changes in the iPad 3 includes improved hardware (therefore performance in line with software evolution), improved camera quality (including High-Definition video recording) and voice dictation. Retina display is an Apple term that means when you look at a video or picture on your iPad, you won't be able to see any of the individual pixels e.g. the distorted bits in as black background, or on a close up/picture taken using the zoom in option on the camera. Essentially this means is if the resolution of the camera is improved, you won't notice any difference with the human eye! At roughly the same time the Apple iPad Mini came to market. Similar in specification to the iPad 2, the mini shipped with a 7.9 inch screen. Apple view the mini as a more convenient yet still functional tablet. The iPad mini 2nd generation, released at the end of 2013, boasts improved hardware and inclusion of the Retina Display technology. 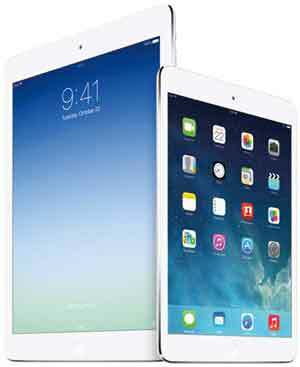 At the same time Apple released the iPad 5, known as the iPad Air. The iPad Air boats similar features to the iPad Mini, such as a thinner and lighter chassis (7.5mm think compared to the iPad 2's 8.6mm). The camera includes face detection and the hardware has been improved. In 2015 we have the iPad Air 2 and iPad Mini 3. As you expect with evolving technology, these devices are lighter, quicker, have better camera functionality, and are more secure with the introduction of Touch ID - Fingerprint recognition to access your device. The rapid releases of different iPad models, with differing capabilities, underlines just how fluid and competitive the tablet market is, and continues to be. Phablets (large mobile phone type devices that site between smartphones and tablets), and slate type devices (tablets that double up as a slimline tablet e.g. Microsoft Surface) are now on the market. The choice for consumers like us are overwhelming, but exciting too as we wait to see what happens next. It is worth mentioning, like a lot of modern devices, the iPad comes with various accessories (at additional cost! ), including the Apple iPad Smart Cover which keeps the screen clean and free from scratches. This also comes in a variety of colours. Personally I have an iPad 2, and it serves me well. Whether it be tablets, laptops or smartphones, my mantra remains to pick the device type, and model, that suits your needs. You don't need to keep up with the Joneses! This page on the iPad revolution is rounded off quite nicely by this comprehensive article on the iPad Air 2 (Opens New Window), published in the Guardian (A UK based newspaper). Part 2 of this tutorial series, iPad Manual, focus on how to use your iPad, including some hints and tips I have picked up through my job and my use of an iPad.